This post was written by Miguel Escobar of Powered Solutions. Thanks! Power BI User groups (PUG) are groups for great people like you (yes, you reading this!) to get together with other awesome people to talk, discuss, and share experiences, questions, and more around Power BI. These groups can have live or virtual meetings so you can choose how to engage or contribute in a way that fits your schedule. I recommend that you join a live one – not only because of the free snacks and beverages, of course, but because you get to interact with other like-minded people and expand your local network of awesome folks that you’ve met. PUGs are a great way to always be in-the-know with Power BI. You can expect conferences, workshops, and more in these events that are usually led by top level professionals like MVPs, MCSA, MCSE, Gold Partners and even by Microsoft employees. The best part of all? Joining a PUG is completely free! All you need to do is go the PUG website, create an account, and join the groups in which you're interested. Meetup.com provides a platform to not only publish an event, but also to manage a Group from their site. Many great PUGs use this platform to improve visibility. Now, we are Power BI users. We love data – but even more we love what we can do with such data inside Power BI. 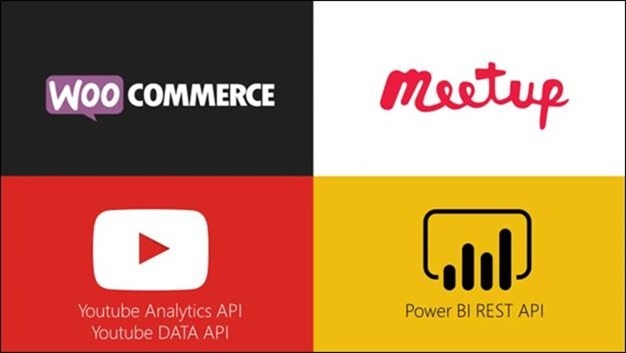 So, why not take the data from the Meetup.com API and analyze it inside Power BI? Well, in celebration of the start of the Power BI World Tour, and thanks to the new Power BI custom connectors, I was able to create my own custom connector, get the data from the PUGs that I found on meetup.com, create a really simple data model, and then create the report that you see below. At the end of 2016, there were 37 PUGs listed on meetup with around 9K users. By August of 2017, we now have 46 PUGs listed and more twice the userbase with a total of 18K users! For every single month of the current year 2017, over 1K new members have joined the PUGs on meetup.com – that’s quite a good trend! There’s a lot more than you can get from this simple report, but I’ll let you explore it so you can draw your own conclusions. Just a reminder, all of this data was sourced from a custom connector. You can see the full code for it on my GitHub. What are Power BI Custom Connectors? Whenever you start Power BI Desktop and go through the Get Data experience, you'll see a list of data sources to which you can connect. Each of the elements that you see in the Get Data experience is essentially a data connector that comes out-of-the-box in Power BI Desktop. A custom connector is essentially a connector that you add to the Get Data menu, so you can connect to a data source that may not be supported yet by Power BI Desktop. With a custom connector, you can use your own logic, and have multiple options for credentials, such as Windows, basic, API Key, and database authentication. You can even set up your own OAuth 2.0 workflow. You create these custom connectors with the same language that Power Query (Get and Transform for Excel 2016) uses, which is a language called ‘M’. The Power BI World Tour has just begun! The start of the Power BI World tour has been total success! There are still a few tickets left for the rest of the tour – don’t miss out!